Do you know that hybrid seeds are relatively expensive compare to their local or improved open pollinated counterparts? Even at this, many farmers end up wasting these already expensive seeds. Why? They don’t really understand the quantity of seeds they need to plant a specific area of land in the first place. Do you know that all the improved seeds are well packaged in sealed tin or sachet, once you open them, the germination rate (potential) starts depreciating. This is the reason why you shouldn’t store an opened seeds’ package for long otherwise you would lose certain percentage of the seeds viability. You might then think; what is the way out? Buy only what you need at a time or open only seed package you need at a time. 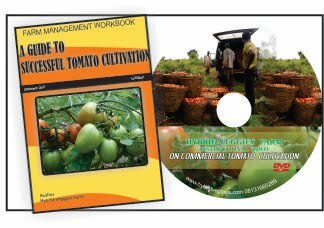 During the course of my consultancy business and farm visits, I have come across not a few farmers who are into vegetable production or about to start vegetable cultivation but they lack one essential ingredient of success; ability to calculate plant population. This can be liken to a building engineer or the likes professionals who gives quotation to a land owner that is interested in building a duplex but the engineer does not have an idea of average number of blocks required to complete the building. I wonder what the quotation is made up of! The first thing you must know is the area of your field. 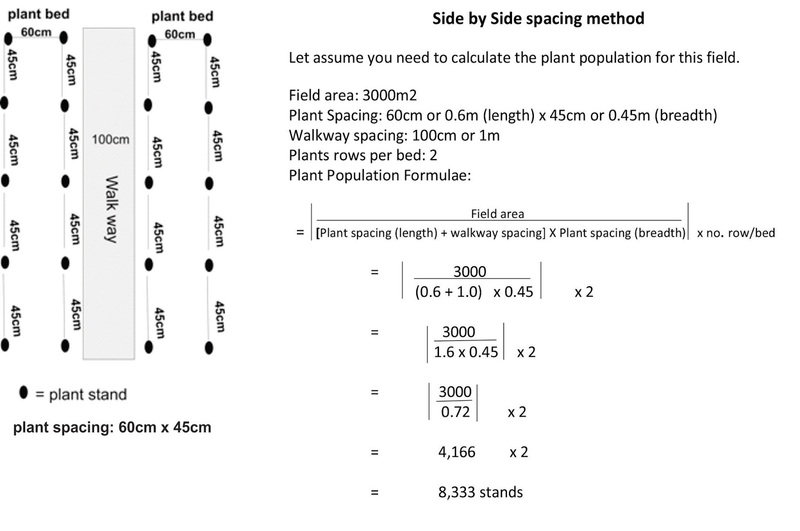 Then, you can now proceed to calculate plant population according to the spacing you want. 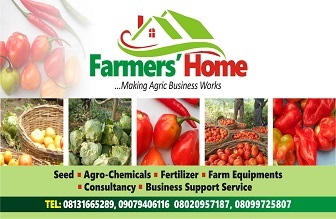 It is upon this knowledge you will base a lot of planning and estimation among which are the quantity of seeds require, the quantity/type of irrigation materials needed, the strength of workforce you might require, the quantity of inputs like agrochemicals, fertilizer etc. needed. 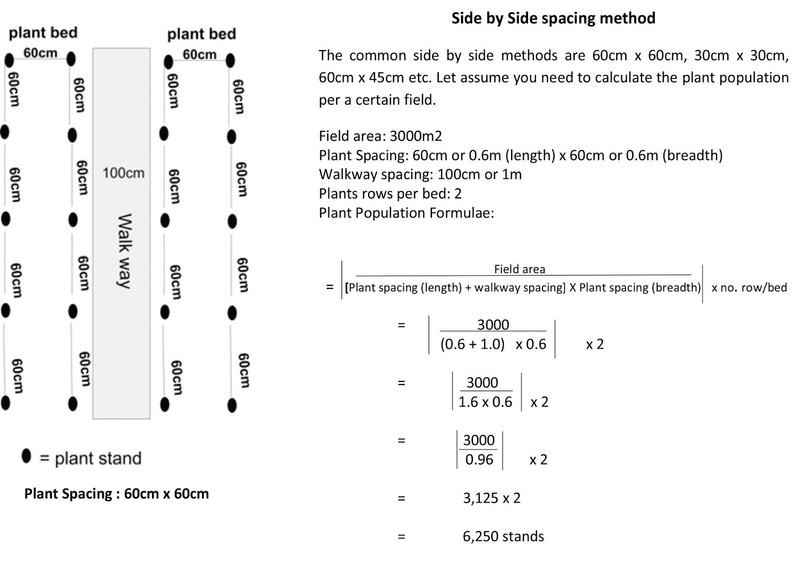 Farming fields basically come in two shapes; rectangular/square; in which case it is easier to measure or shapeless field; in which case you might need to understand the technique requires to measuring the area. A field may not always be a rectangular shape but all the same, find a way of measuring the area. As for a rectangular shaped field, you measure the length and the breadth and multiply both to get the field area. You would understand better by studying image 1.0 below. In summary, you would measure the presumable length then measure the breadth in 4 to 5 places, find the average and multiply with the length.After coming up with the area, you can now decide on your spacing method. There are many conditions that dictate the kind of spacing method you would use: time of the year, crop type, irrigation method/type, method of field preparation, expected yield, farm practice etc. I would look at these conditions in-toto in another of our articles. There are many advantages to having a well-designed and aligned planting pattern. Some of them are increase in yield, ease of diseases and pest management, ease of walking through/working the farm to carry out routine activities, aesthetic value etc. The common spacing methods are outline below. 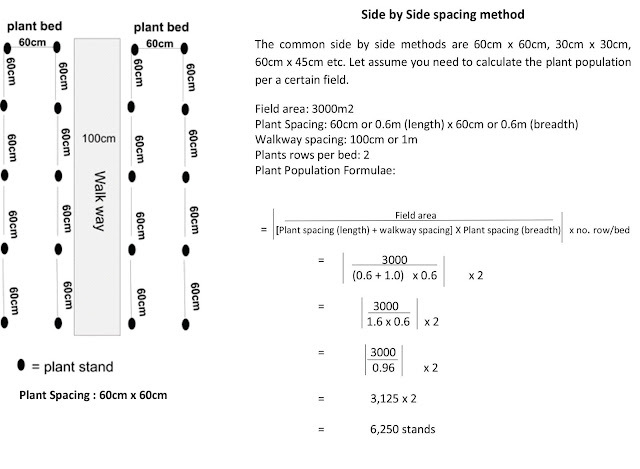 let assume you want to use 60cm x 60cm x 100cm spacing. 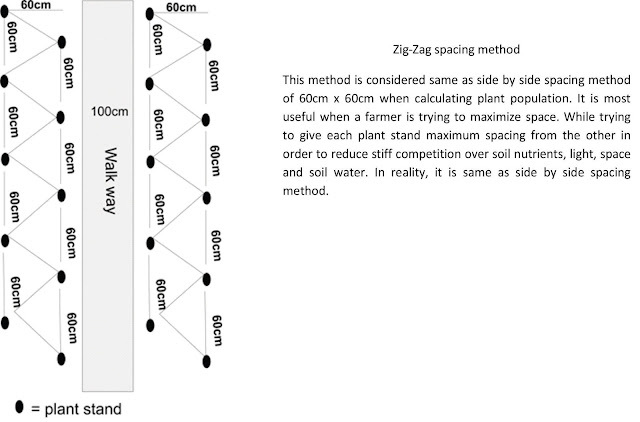 What this means is that the distance between one plant stand and the other is 60cm while space between one bed and another is 100cm. There are two rows of plant stands side by side on each bed. Note that in most places where plant spacing recommendation is given, they don’t give the spacing between beds (walk way), that is usually personal decision. This is similar to the 60cm x 60cm except that this house more plant population per area of land. 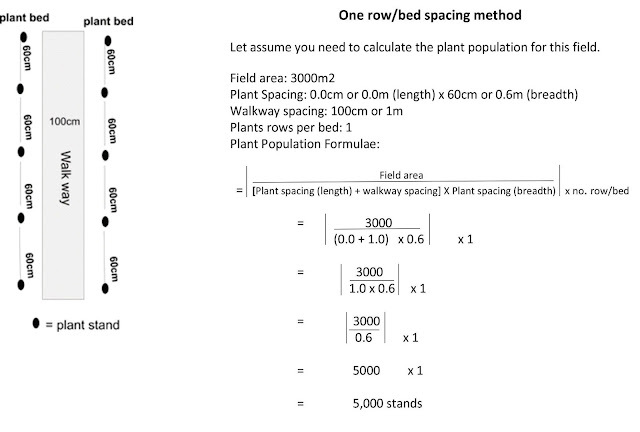 I did mention above that there are factors that govern spacing methods you wish to use. There are methods that fit in for wet season as well as methods that fit dry season. (See image 1.3). One would have taught this spacing method would house more plant stands per certain area of land compare to others above but let me give you a shocker, there is little difference in plant population but subjects to space of the walk way. If the spacing of the walk way is the same as that use in the above methods, then there is little difference in plant population. (See Image 1.4). Having a good understanding of plant spacing is an essential ingredient to success in farming. Upon this, you can plan a whole lot and do accurate budget. In addition, it should be noted that plant spacing calculation is not with the intention of getting exactly accurate figures but an idea of the average number of stands you are working at. Upon this, buying of seeds, chemicals, fertilizers and others would be based. I hope you gain something from this article. If you do, please leave a comment behind. You may also read another of our article ( Click link ) that explain how to understand the amount of seeds per gram for every common vegetables. Combining the knowledge from the two articles would surely make you a professional.